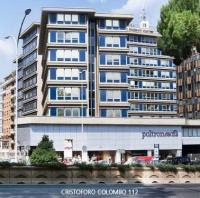 Residence Colombo 112 is set on one of the main roads leading between Rome city centre and the EUR business district. Wonderfully modern rooms and apartments are available here. Residence Colombo 112’s unique location puts you at 10 minutes’ drive from both the Coliseum and EUR’s offices and conference centres. Here you don’t need to worry about limited traffic areas or where to find parking space. Transport links here are plentiful too, with a bus stop just 50 metres away and the Metro a 10-minute walk. Enjoy complete independence at these well-soundproofed apartments. Rooms at Colombo 112 vary in size and style and all rooms come with a kitchenette, satellite TV and internet. Hotel services are available at the Colombo 112 however, with a friendly reception available, cleaning carried out daily and laundry facilities on site. As a guest here you will also benefit from discounts at a nearby gym.